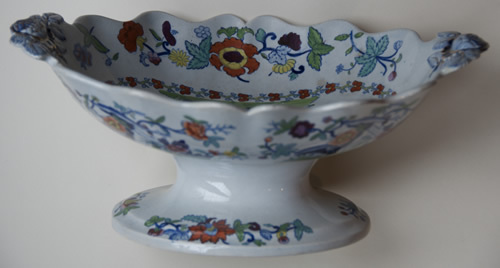 For dessert wares of similar shape and fan moulded handles click here. 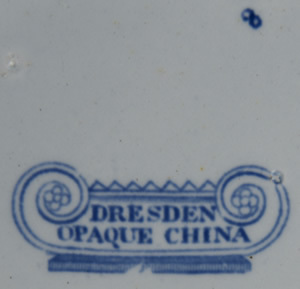 Pattern 767 "Japan Opaque China"
Pattern 844 "Dresden Opaque China"
The dessert plate is 209mm in diameter. 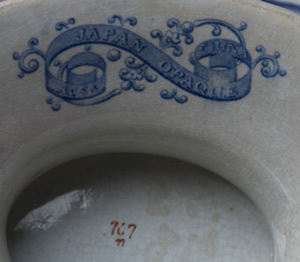 Earthenware. 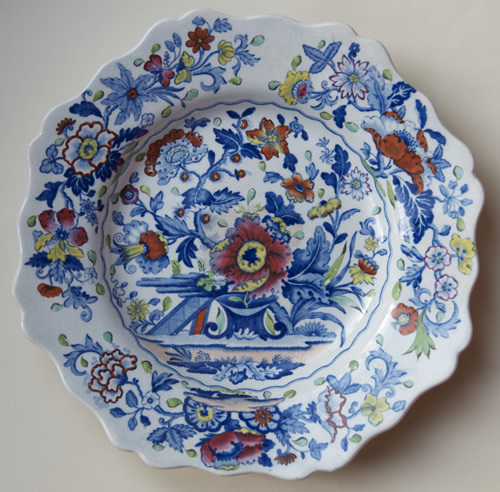 For dinner wares with the same print see here. See also K. Church, 'J. 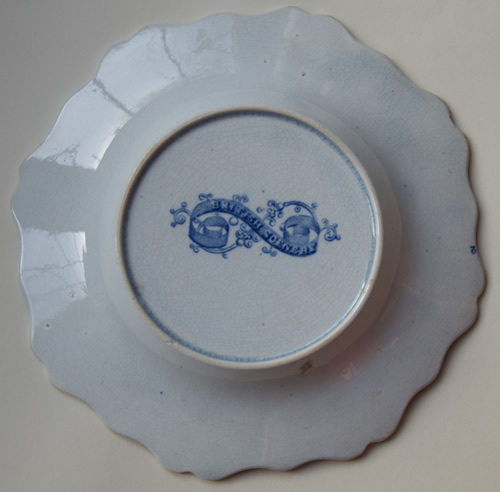 & W. Ridgway - Anonymous Marks', Northern Ceramic Society Newsletter 107 (Sep. 1997), 14-19. Riverside Cottages. 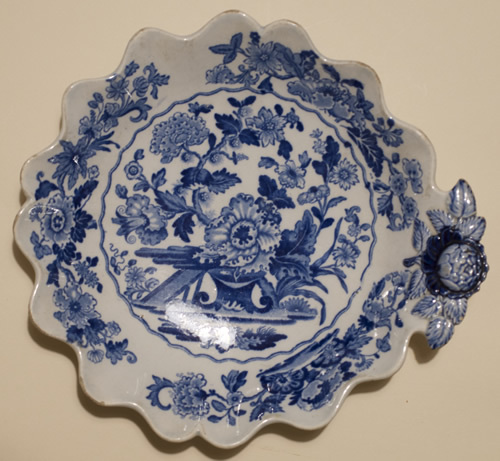 The dessert plate is 207mm in diameter. 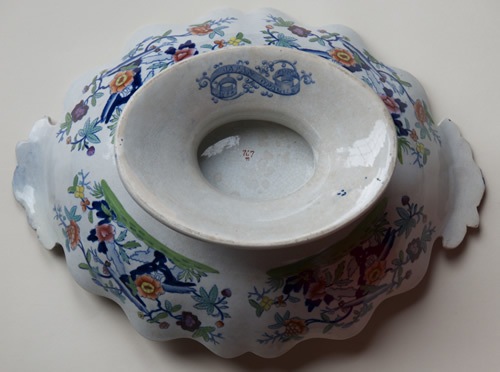 Earthenware. Riverside Cottages. 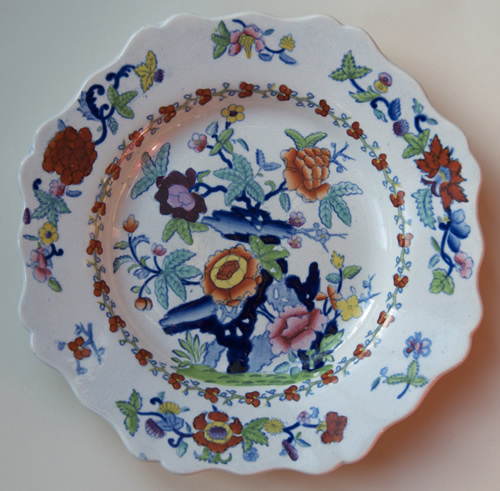 The dessert plate is 208mm in diameter. 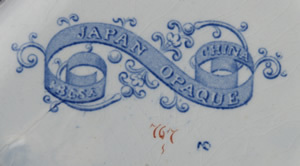 Earthenware. An alternative version without the blue edge line. 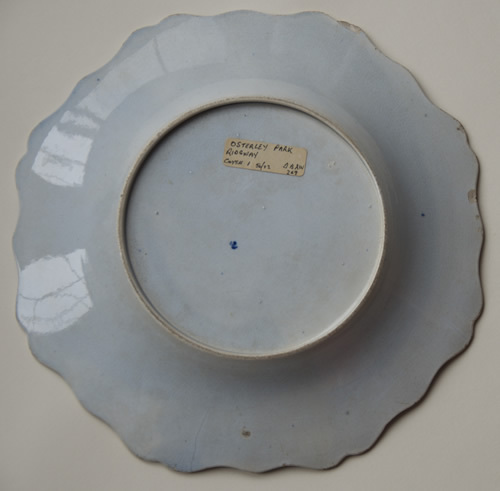 The base of this plate is heavily potted, and so thick that the seller thought it was a tureen stand. 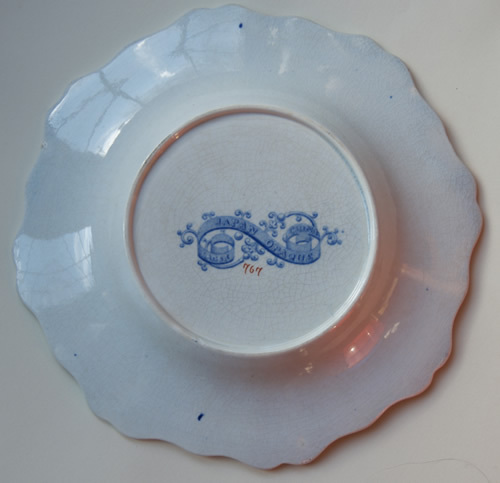 The tally mark, a "2", is in a very odd place, right on the extreme edge of the plate. 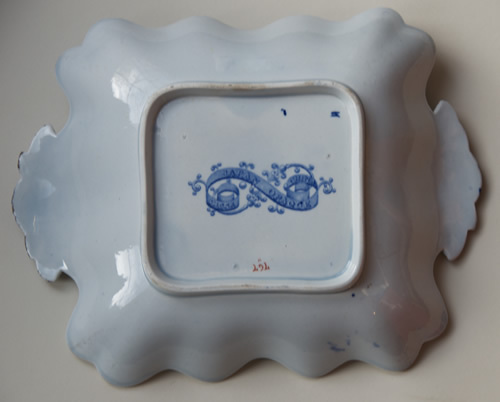 The square dessert dish is 234mm long and 187mm wide. 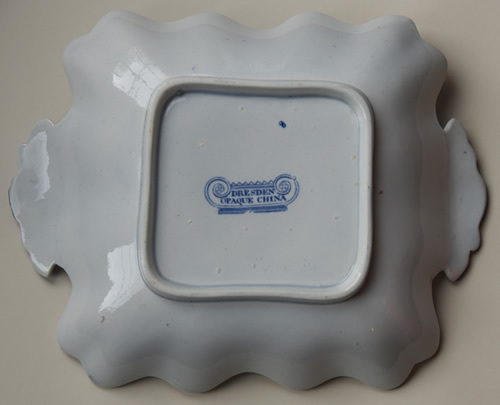 Earthenware. The figure "8" is probably a tally mark. 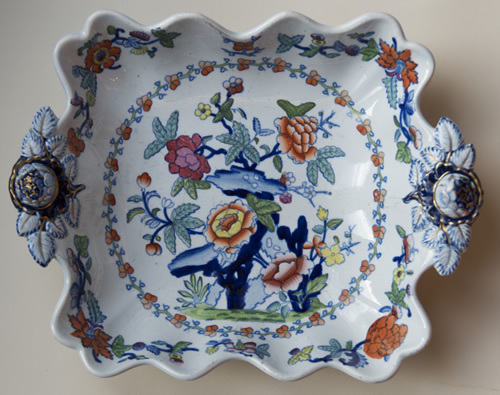 The shell dessert dish is 221mm long and 202mm wide. 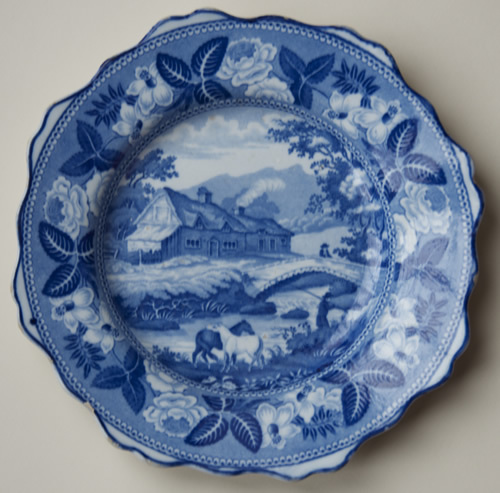 Earthenware. 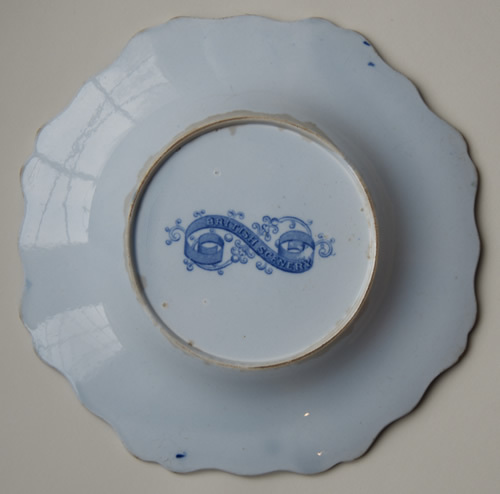 This pattern has a sprigged circlet of flowers on the border. 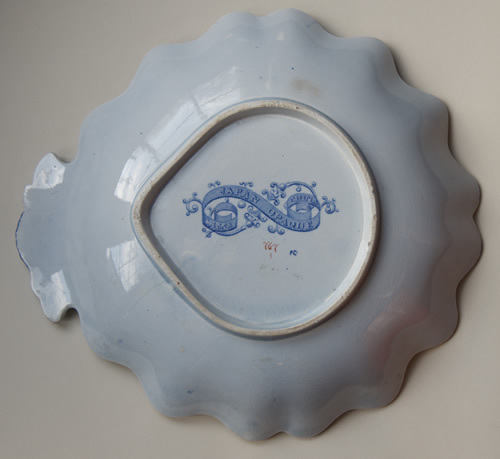 The oval dessert dish is 261mm long and 196mm wide. 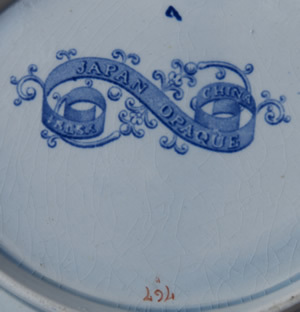 Earthenware. 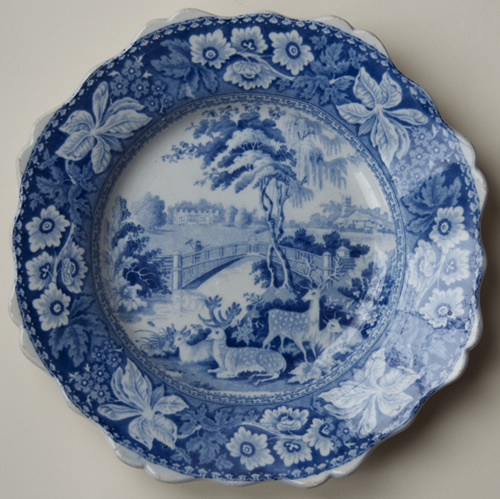 For dinner wares with the same decoration see here. N.B. 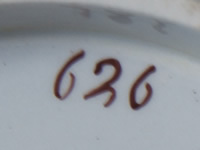 The similarly decorated, but bone china, service labelled as pattern 767 in Colour Plate 2 on page 19 of Godden's Ridgway Porcelains (Woodbridge, 1985) is, in fact, pattern 747 as stated in the list of Colour Plates. 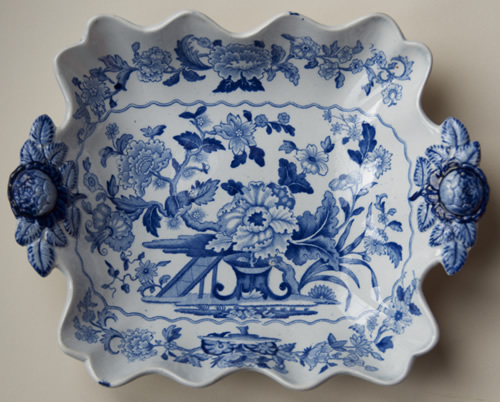 A fruit basket and stand of pattern 767 is correctly labelled on page 27, Plate 19. 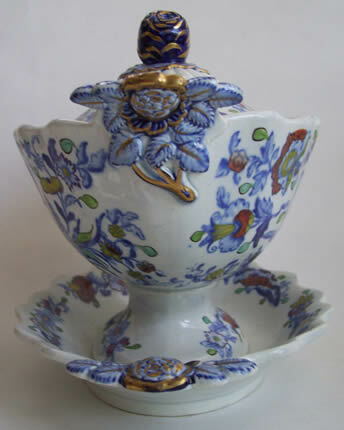 The dessert centre piece is 302mm long, 228mm wide, and 137mm high. 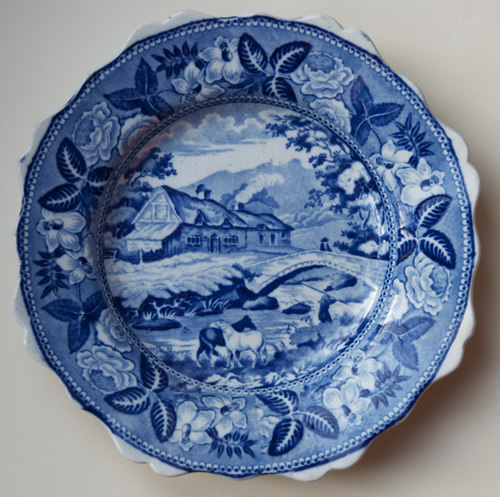 Earthenware. 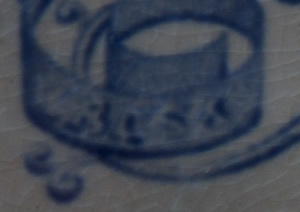 Exactly what is written on this part of the ribbon, and what it stands for, is something of a mystery. 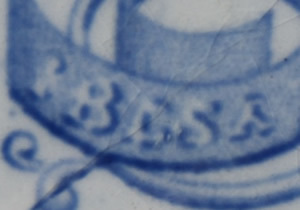 It appears to read "JRϹSX" or possibly "JRΣSX", but no one has been able to suggest the meaning. 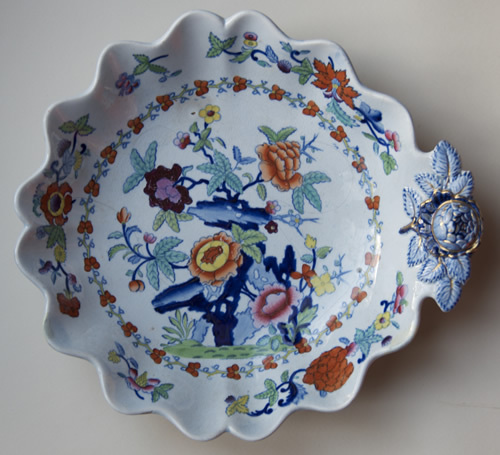 The square desesrt dish is 234mm long and 185mm wide. 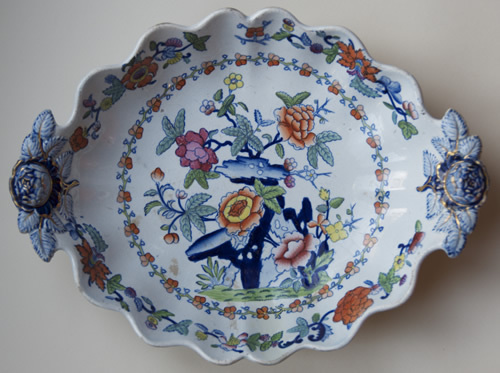 Earthenware. 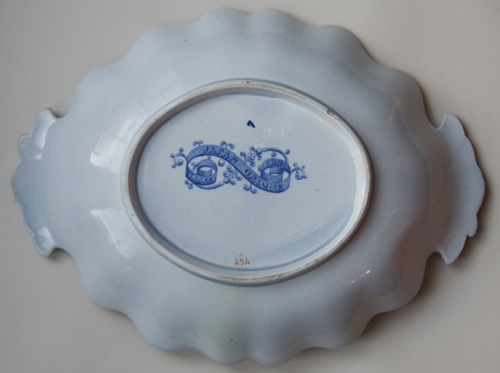 Perhaps the middle character is intended to be an ampersand, so "JR&SX"? 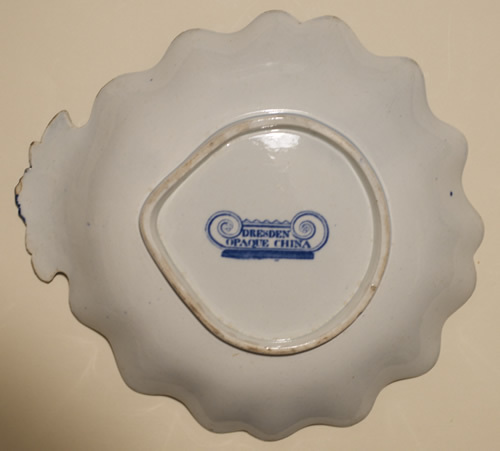 That still doesn't explain the "X", but "JR&S" could be for Job Ridgway and Sons. 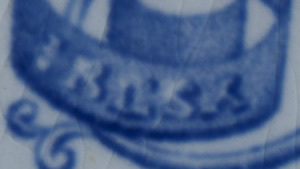 The low pattern number makes it probable that Job Ridgway was still the senior partner at this time. 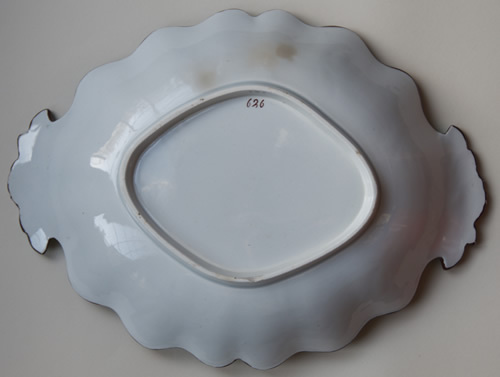 The oval dessert dish is 254mm long and 192mm wide. 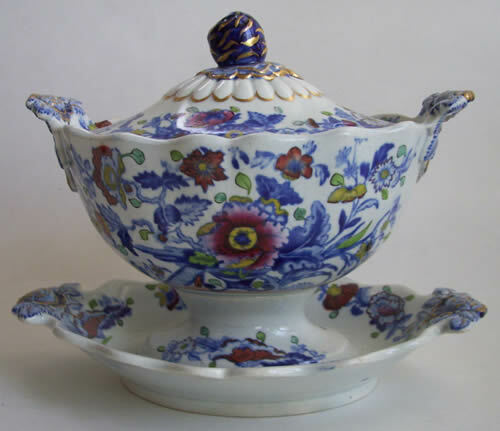 Earthenware. The "7" is probably a tally mark. 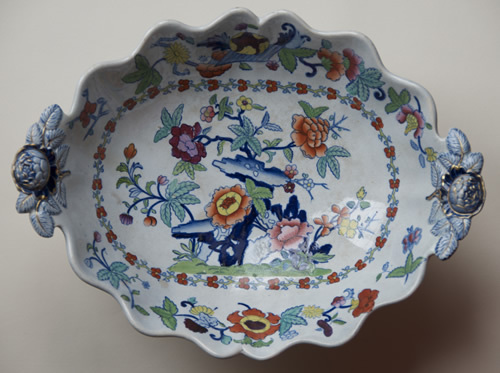 The shell dessert dish is 221mm long and 204mm wide. Earthenwre. 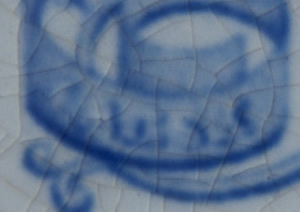 There is a crack leading from the bottom left corner of the backstamp through the foot and part way to the edge. 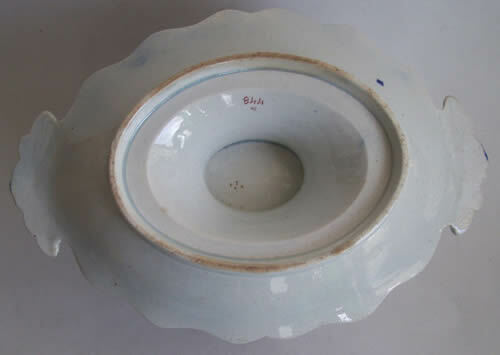 The way the glaze has gathered round it inside the foot rim indicates it was originally a firing crack, but has developed with age. The "2" is probably a tally mark. 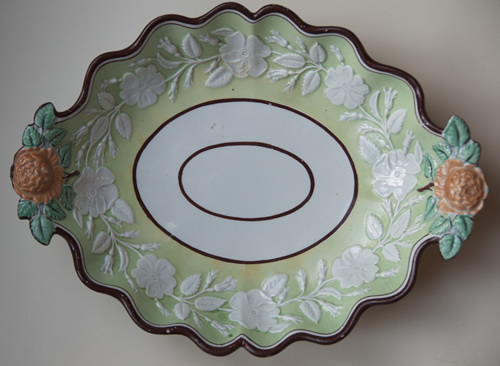 The dessert plate is 210mm in diameter. 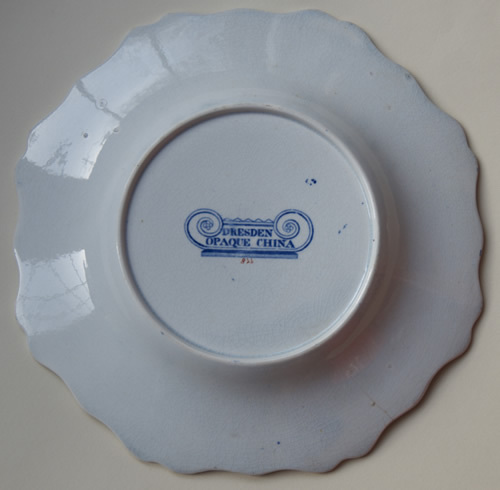 Earthenware. 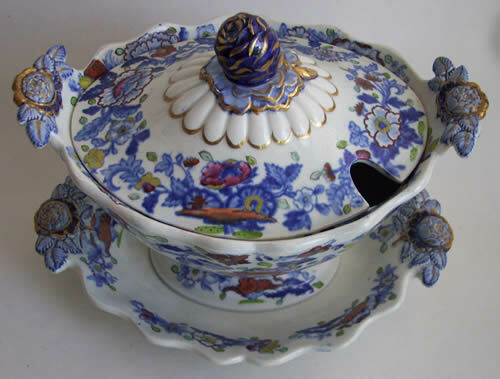 The dessert tureen is 190mm long, 140mm wide, and 147mm tall. 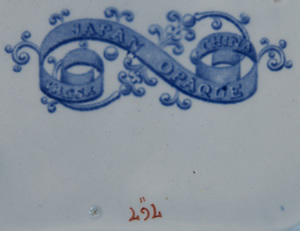 Earthenware. 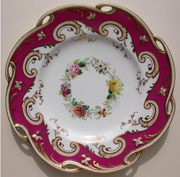 The dessert plate is 211mm in diameter. 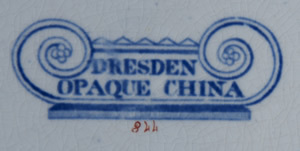 Earthenware.